Winston stared at the miniature house with its fresh coat of paint and its perch, feeling a mixture of pride and anxiousness. Birds flying through his yard would now have their own special place to relax, and he envied them. He paced around inside the house. Eyes darting, he couldn’t find a trace of his ex-wife. How to get over her completely? He’d begun with a list of all the things he wanted to change about himself. He learned to cook, established an exercise routine and vowed to stick with it, stopped watching so much television in favor of reading more books. He made lists of herbs to plant in his garden, carpentry simple and complex around his home (the birdhouse being a small, most recent example), places around Philadelphia to visit via bicycle, new gastropubs to frequent, etc. He even made a master list of his various lists, for organizational purposes. But today he couldn’t think of a single thing he felt like doing. Unnerved, he felt. Who was he anymore without something to do? Back in the backyard, he stood and stared. A light breeze passed and made his neighbors' wind chimes chime. He took a deep breath and sat in his favorite chair, an outdoor rocker with comfy cushions. Maybe I’ll just do nothing for a few hours, he thought. He fell into that peaceful zone between wakefulness and sleep. 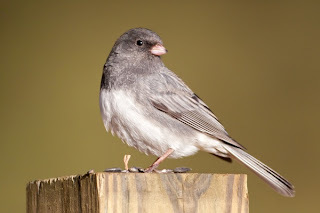 A Dark-eyed Junco flew from a nearby tree and stopped momentarily on a fence post in Winston’s yard, listened to him as he snored. I was really drawn in by Winston and would like to read more. The "Who was he anymore without something to do?" line reminds me of the men I know. Thanks, Karen! That question conjures many a person and situation for me too. Ditto what Karen writes above. A little glimpse of quotidian reality. Thanks, Jack! I always appreciate your twitter mentions, and now it's great to see you here with a comment. Stating that a story reminds you of something in your life, let alone yourself, I take as a wonderful compliment, so thank you! The realization it's OK to do nothing sometimes... priceless. Hi, Thomas, and welcome! I was hoping people would pick up on that notion of it being OK to do nothing. In my opinion, doing nothing is very underrated and undervalued in American society. There's this seemingly universal perception that we should always be doing something, and I for one think it's unfair. Thanks for your comment and I hope you visit again! Found this to be oddly peaceful, Richard. Thanks, John, that's nice to hear as I'd hoped that by story's end, that's how readers would feel. I always appreciate your comments. This story was like a comfy blanket- much needed on a dreary day like today. Glad you found comfort here, Bev! A real sense of loss here, deciding to be his own person again, one couldn't help feel Winston's emotions here, his need to make a new life, and yet the lack of purpose that seemed to exist for him right now but also a recognition that he could do nothing if he choose to. Nice work Richard. Thanks, Helen! Recognition that he could do nothing was certainly the key for him. That "peaceful zone between wakefulness and sleep" is one of the best places to visit. I love it there. Me too, Tim! Thanks for the comment. It's so undervalued in American society, I think, Steve. We seem to feel we should always be doing something, but a little bit of nothing between activities is healthy, I think. The peacefulness of nothingness, captured very eloquently. Thanks for reading, Adam! I appreciate the comment and the compliment it contains. That's a lot of story in such a short space Richard. I have a feeling if only he'd started his lists before the wife became the ex, she wouldn't have become the ex. Or would she? Not sure, Deanna, but you may be right. In an older story here called 'Assigning Blame,' Winston reveals that his wife was cheating on him with one of his co-workers, and I'm not sure whether that would've happened anyway. Thanks for the compliment!